James Barrett Reston was one of the most prominent journalists of his era. As a columnist for the New York Times, millions of Americans read his insightful analysis of national and global events, including Cold War-era tensions between the United States and Soviet Russia and the Nixon administration’s reopening of diplomatic relations with China. 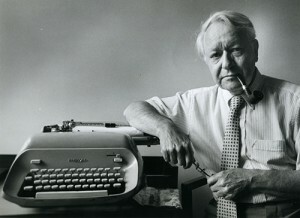 The following exhibit, “James B. Reston: The Life and Career of the ‘Dean of American Journalism’” explores Reston’s life from his youth in Ohio and as a student at the University of Illinois, to his ascent at the New York Times, through photographs, oral histories, and historical documents.